Eniva® Eye Health+ Liquid Concentrate is a highly potent nutritional supplement specifically formulated to support eye health and address the issues of supporting sight and retaining macular health. * EnivaEye Health+ utilizes Eniva's proprietary liquid technology to provide liquid vitamins, minerals and antioxidants for healthy eyes. * Clinical and research studies have strongly supported the use of nutrients to help promote ocular health. * The exclusive formulary matches the nutrients ratios found in the macula of the eye. The advanced liquid formula of Eniva Eye Health+ aids in quicker absorption and use of ingredients than tablets or pills which must first dissolve in the digestive system before being absorbed. * 40% of people have problems swallowing tablets or pills, and an aging digestive system particularly common in the elderly, makes digesting tablets and pills even more problematic. Zinc: Catalyst for conversion of vitamin A to its active form retinaldehyde in the retina. Ingredients: Purified water, ascorbic acid, sorbimacrogol, inulin (from chicory root), d-alpha tocopherol acetate, natural flavor, glycerin, zinc (from zinc sulfate), stevia leaf extract, zeaxanthin, sorbic and/or benzoic acid(s) (protect freshness), soy lecithin, lutein, beta-carotene, riboflavin-5-phosphate, copper (from copper sulfate), grape seed extract, selenium (from sodium selenate). Directions: Adults: 1 Ounce daily (30mL). Best if divided 15mL am and 15mL pm. Shake well before using. Upon opening first time, seal may release air. Recommendations: May combine with 8 ounces of water / juice. Eniva® Eye Health+ should be taken with food. SMOKERS: Please consult your health care professional about the risks associated with smoking and using beta-carotene. I have been using for healthy eye care. Recommended by doctor for treatment of macular degeneration. Best price is online. My husband and I both take Eye Health twice daily. I have experienced excellent results with my vision. My husband'seye pressure is stable and normal. We have been taking it for at least a couple of years, and intend to keep taking it . We are both in our 80s. Eye Health works for me! My husband and I both take Eye Health twice a day. EyeHealth has kept our eyes stable. I'm very grateful. 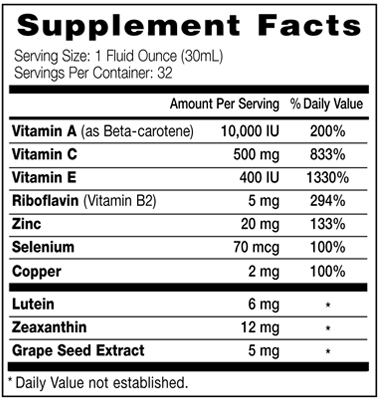 I like how the Eniva Eye Health is easy to take and has a tangy flavor. I can tell the ingredients are good for my eyes.